Symbols*: Rays of light penetrate the translucency of the ocean. This is representative of tapping into the unconscious terrain of the psyche. The light penetrates the wonderful reservoir of inner life. The fish are swimming harmoniously, representative of the imaginative ideas that are circulating in the mind. The dolphin is an intuitive guide. It is able to help us direct creative energies into physical manifestations. The sea turtle is quietly floating through deeper waters of the psyche, its quiet strength capable of focusing on the less-recognized elements of our inner, deeper terrain. The god is covered with seaweed. The seaweed exemplifies movement and fertile energy. A bright, radiating spiral originates from the young god’s chest area. His heart is leading him through the waters of subconscious exploration. He is learning to listen to his inner voice as it navigates him through unsheltered territory. The birds above the surface represent the spirit and transcendental thinking. 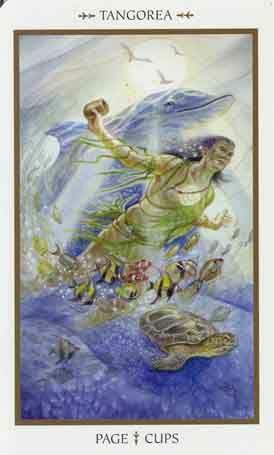 Description*: Tangorea is the Polynesian god of the oceans and sea life. He is an offspring of the earth and sky gods whose separation resulted in the creation of all life on earth. His influence is scattered across the Pacific archipelagoes, where various incarnations of the sea god can be identified. In some myths he is portrayed as a malevolent deity engaged in endless conflicts with Tane Mahuta, god of the forests. In other myths he is the creator god. The Maori tell of the endless destructive cycle between Tangorea and Tane Mahuta. After being driven from the forest by Tane Mahuta, Tangorea assumed the domain of the ocean. Tane Mahuta provided the mortals with fishing vessels, spears, and other implements for catching marine life. The pillaging of fish set Tangorea into a fit of rage. He tried to avenge the violation of the sea creatures that he considered his children by sending eroding floods to Tane Mahuta’s shore. Possible Meaning: Tangorea’s deep ties with his oceanic creations demonstrate how influential emotions can be. This is a time to nurture the love we may feel for someone. We should allow emotional bonds to strengthen and be willing to demonstrate loyalty toward those we really care about. Thoughts/Points to Ponder: His inspirations come from the animals of the ocean. He is sensitive but very wise. He has learned to adapt to new situations faster and easier. He loves his companions and would do anything for them; he defends them if someone comes in the way. He is protective of his own. He is very compassionate and empathetic. This is a gorgeous place to be.